Deb Marlowe was one of the first people I met at my first RWA national conference in 2009 and one of the nicest. Since then, I've followed her writing journey with pleasure. 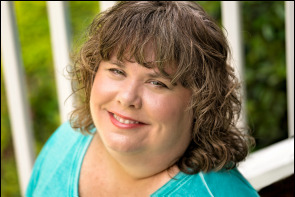 Today, I'm delighted to welcome her to The Romance Dish to talk a bit about her two novellas in the multi-author Castle Keyvnor series. A Golden Heart Award winner and Rita nominee, Deb grew up in Pennsylvania with her nose in a book. Luckily, she'd read enough romances to recognize the true modern hero she met at a college Halloween party--even though he wore a tuxedo t-shirt instead of breeches and boots. They married, settled in North Carolina and produced two handsome, intelligent and genuinely amusing boys. Though she spends much of her time with her nose in her laptop, for the sake of her family she does occasionally abandon her inner world for the domestic adventure of laundry, dinner and carpool. Despite her sacrifice, not one of the men in her family is yet willing to don breeches or tall boots. She's working on it. Last fall, twelve authors got together for the Haunting of Castle Keyvnor series. It was a series of stories, all set at the reading of a will in a haunted castle in Cornwall. We had great fun intertwining the stories of our Hambly family and their friends and acquaintances, and creating all manner of paranormal creatures in and about the castle, including ghosts, gypsies, witches, a demon and pixies! My contribution to that collection was Lady Tamsyn and the Pixie’s Curse, in the book Bedeviled. It's what it feels like when she discovers that she can see the truth behind the lies that men tell. All she wanted on arrival at Castle Keyvnor was to avoid Mr. Gryffyn Cardew, but in a sea of lies, he is the one who always tells her the truth. Together they find that her curse might just be a gift--and their love the key to preventing a tragedy. This year we decided to go back to the castle at Christmas! 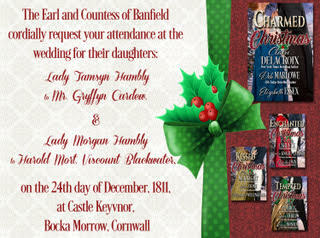 Two of the Hambly girls are getting married in a double ceremony on Christmas Eve—and we have twelve new stories set in and about Castle Keyvnor! This time my story is Lord Locryn and the Pixie’s Kiss, in the book Charmed at Christmas. When is a kiss actually a curse? When an irate Pixie forbids you to kiss the wrong girl---ever. Unfortunately, Lord Locryn Pendarvis has no idea why girls are falling all over themselves not to kiss him. He only knows that after a certain point, the risk of humiliation outweighs desire. Until he meets Lady Gwyn Hambly again. She's witty, charming and beautiful---and just as interested in him as he is in her. They'll do anything to ensure their future together---even fight the supernatural forces aligned against them. PJ, again! Prepare to be charmed by these sweet, delightful tales of love, romance, and a bit of magic set on the wild Cornish coast. I thoroughly enjoyed both novellas. My only complaint is that I want more! 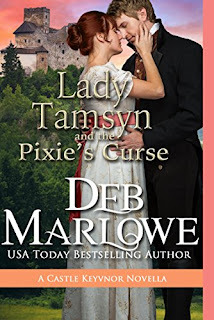 In both stories, Deb Marlowe transported me to Castle Keyvnor and into the lives of her characters, both human and supernatural. Those characters - humans, pixies, ghosts, demons, and more - are richly vibrant and fully dimensional, engaging both my interest and my emotions. Surprisingly, my emotional attachment to a well-meaning pixie and a young ghost were as strong as my bond with the human couples. Their stories, while short in length, are packed with everything I could want in a full-length romance, including sigh-worthy happy endings. Tamsyn, Gryff, Gwyn, and Locryn are all likeable characters, for whom I cheered from beginning to end. I'm hoping Deb Marlowe plans more stories at Castle Keyvnor. I'm more than ready for a return trip! Have you read any of Deb Marlowe's stories? Do you enjoy romances with a touch of magic? Do you read holiday-themed anthologies? Because I enjoyed these novellas so much, I'm giving away a Kindle copy of Lady Tamsyn and the Pixie's Curse and a Kindle copy of the Charmed at Christmas anthology which includes "Lord Locryn and the Pixie's Kiss." Yes to every question. I started reading Deb Marlow years ago and always enjoy her stories. Awww! You made me smile, Carol! Thank you! Yes to all but things that go bump in the night. 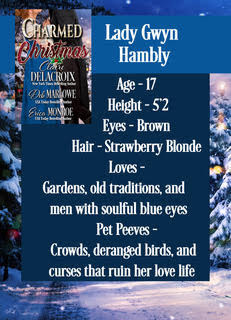 I can't wait to read Charmed At Christmas! I hope you will enjoy, Amy! I love holiday romances. A little bit of Christmas magic never hurt a story. I had a great time researching the Cornish Christmas traditions--they are quite a bit different from the rest of England! Deb, I'm glad you included the Cornish traditions. I found them fascinating. I love holiday romances. I enjoy Christmas anthologies, and I have quite a few on my keeper shelf. I enjoy books with some magic. I have read books by Ms Marlowe and I enjoy them a great deal because of the humor. And I have lived in 2 houses which seemed to have occupants who were not visible, but their activities were quite visible. The first house was a short term rental...which is good because I was unable to sleep there. It was freezing cold in July in Ohio. It scared me to death. The second one, the surprise occupant was funny and silly. I believe the goal there was just to make people laugh. Thank you for the kind words, Annette! Ooooh, spooky about the cold rental! I was in a pub in London once, having lunch with a large group. The manager came up and propped open the door to the room. "The ghost doesn't like it when the door is closed," he said. Very nonchalant! I love her humor too, Annette. I'm not sure how I'd feel about living in an "occupied" house. I have been in homes in Savannah that I'm pretty sure have otherworldly inhabitants but, thankfully, I didn't have to sleep there! I have read a couple Deb Marlowe's books and enjoyed them. A touch of magic adds a bit of something special to a story. I believe there is magic in the world and we need to recognize and be reminded of it. Seeing it in a story helps. Do I like holiday themed anthologies? I have 2 shelves of them. That would be a big yes. Do I believe in things that go bump in the night? Most definitely. We have several shots in our house and they have made themselves known. I've also read some of Deb's books, and enjoyed them. I also believe in things that go "bump in the night". I don't read e-books, so there's no need to enter me into the contest.